The Bronx Puerto Rican Day Parade is Sunday, May 15, along the Grand Concourse. Cultural, community, youth, and school groups are wanted to march in parade. Info bxprparade(at)yahoo.com. Join our Facebook page at http://Facebook.com/bxprparade or follow @bxprparade on Twitter. Bloggers Clarisel Gonzalez of Puerto Rico Sun Communications and Ed Garcia Conde of Welcome to Melrose and entrepreneur Darada David of PeaceLove Cafe are joining forces to host “Bronx Blogger Fiesta: A Community Mixer,” on August 31st. This free event at the PeaceLove Cafe in the Bronx is open to bloggers as well as community and business leaders. Needed art director/set designer, hair stylist, sound person, camera operator (with a HI-DEF camera and/or experience) and script supervisor/continuity person. Production assistants (willing to work including doing some manual labor if needed) for independent movie project, “Bronx 3M,” a coming of age story of three Latino teens in a city going up in flames. Shooting to start in October. Bilingual English/Spanish is a plus. Experience preferred. Please send a resume. Deferred payment — please don’t respond if you are not interested in deferred payment. Thanks. MONA – Lead Role. Latina 17 years old. Sassy, stylish, loyal best friend. Vulnerable with a deep secret. Actress must be petite, feminine. ZUNI, CARMEN and INDIA – Support. Any race. 20-40, Lesbian, Confident. mature opinionated. Actors must stradle the line of Butch/Feminine. EXTRAS – Actors to play teenagers in group scenes. Adults to play other roles. Needed wardrobe and hair stylist, sound person, camera operator, continuity person. Production assistants too for independent movie project, “The Bronx 3M,” a coming of age story of three Latino teens in a city going up in flames. Shooting to start later this month. Bilingual English/Spanish is a plus. Experience preferred. Please send a resume to prsuncom@yahoo.com. Casting a new film “Bronx 3M” (working title), the story of three Latino youths (Maria, Michael and Mona) coming of age in a city going up in flames. The “Bronx 3M” is a trilogy. We are currently casting for “Mona’s Move,” the story of a Latina teenager struggling with her sexual identity and those of others. Looking for all types and ages — especially teenagers and young adults. Bilingual (English-Spanish) a plus. Deferred payment. “Bronx 3M” is produced under the auspices of MediaNoche’s Digital Filmmakers Program and is made possible with the support of NY Foundation, Manhattan Neighborhood Network, NYSCA and individual donors. Casting a new film “Bronx 3M” (working title), the story of three Latino youths (Maria, Michael and Mona) coming of age in a city going up in flames. 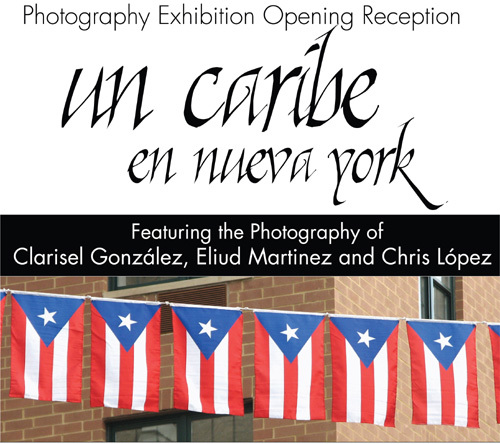 Cemí Underground presents “Un Caribe en Nueva York” A photo exhibit by three talented Puerto Rican artists Clarisel Gonzalez, Eliud Martinez and Chris López. Opening reception Friday January 4, 2008 at 6:00 PM. 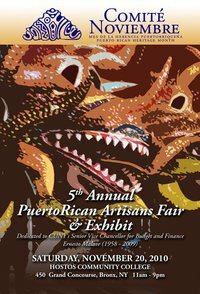 The exhibit runs until January 18, 2008. 1799 Lexington Ave. @112th St.